Migrating turtle doves will be shot down as they fly over Malta. The Maltese government has sanctioned the slaughter of 5,000 European turtle doves as they fly over Malta in the last stages of their 5,600 km journey from wintering grounds in West Africa to breeding grounds in Europe. No other European country allows spring hunting of turtle doves. The Maltese government applies a derogation to exempt Malta from the EU Birds Directive, which prohibits hunting any species of conservation concern. Hunters with special licenses will be permitted to shoot turtle doves during the spring period, which will run from 17th to 30th April, three days short of last year’s spring hunt. The reduction in the turtle dove quota – set at 11,000 last year – is an apparent attempt by the government to reduce the impact of the hunt on bird populations. Hunters also have a quota of 7,000 turtle doves for the autumn season, which will be restricted to September this year, although the reduction in the hunting period is unlikely to affect the death toll because few birds are seen after September. Although the government justifies the hunt on the basis of an agreement with the European Commission, Birdlife Malta says that derogations are not agreed in advance by the EU. They are temporary exceptions to law made by governments, but they must meet stringent EU criteria. Before last year’s spring hunt, a referendum was held to decide whether to maintain or remove the Maltese law that allows the derogation. Despite widespread Maltese opposition to the hunt and scientific evidence for the turtle dove crisis, hunters narrowly won the referendum to continue their traditional slaughter. Eduardo Gonçalves, chief executive of the League Against Cruel Sports says it is incomprehensible that the Maltese government is allowing another spring hunt. “The science shows that the turtle dove is in serious decline but instead of listening to the science the Maltese government has bowed to a vociferous hunting lobby,” he told the Guardian. Maltese hunters argue they are being unfairly criticised over their legal hunt when other European countries kill many more turtle doves illegally. Populations have plummeted such that last year the European turtle dove was reclassified from ‘least concern’ to ‘vulnerable’ on the International Union for Conservation of Nature (IUCN) Red List for Endangered Species. Since 2000, the European turtle dove has declined by 30 percent throughout Europe and by 90 percent in some countries, according to Birdlife International. Malta is right to be concerned about illegal hunting in other countries on the Mediterranean flyway. The European Commission estimates 2-4 million turtle doves are shot down annually in Malta, Cyprus, France, Italy, Spain and Greece. But the spring hunt in Malta is a legal event that could easily be stopped with immediate benefit to populations. Turtle doves follow a route from Africa to Malta before fanning out across Europe to breed. If this springtime massacre was stopped, birds that have survived the long migration would be given the chance to return to breeding grounds where they could raise chicks. Other EU countries hunt turtle doves in autumn, and although this is unacceptable for a vulnerable species, it doesn’t impact breeding so directly. Birdlife Malta stresses the spring hunt is unsustainable and must be stopped, whether from a conservationist viewpoint or a hunter who wants to hunt in autumn. “Killing birds in spring when they’re returning to Europe to breed has a disproportionately high impact on the maintenance of the population, by preventing those individuals nature has selected, from reproducing and replenishing the population’s numbers” – Nicholas Barbara, Birdlife Malta conservation manager. How rigorous is quota enforcement? Conservation groups have also questioned whether the quota enforcement and prosecution for transgression is rigorous enough. Hunters have killed other species during the spring hunt, including rare birds of prey. Birdlife Malta says illegal hunting is a serious problem and Malta has the highest density of hunters per square kilometre in the European Union. How many hunters can correctly identify their target in flight and how motivated are they? After all, they aren’t birders finding pleasure in identifying a bird held in high esteem. Tradition and sport should no longer be acceptable reasons to slaughter wildlife. 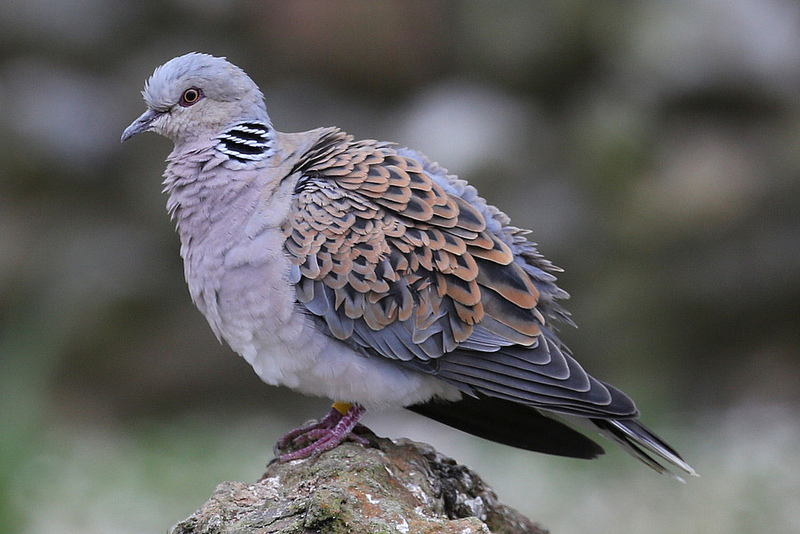 One bird that has so far avoided running the gauntlet of gunshots over Malta is Titan, the turtle dove at the heart of Operation Turtle Dove, a partnership between the RSPB, Conservation Grade, Pensthorpe Conservation Trust and Natural England. The UK’s Royal Society for the Protection of Birds (RSPB) launched Operation Turtle Dove in 2012 to support the recovery of the timid turtle dove, heard in open woodland during summer and recognised by their gentle “turr-turr” call. Once common in England and Wales, these thrush-size birds with tortoiseshell plumage on their back and wings and distinct black and white bars on their neck, are now mostly confined to East Anglia and pockets of south-east England. Titan was found in the Sussex garden of an RSPB supporter and fitted with a satellite tag in September 2014. Tracking Titan on his remarkable migratory journey has given the RSPB Centre for Conservation Science valuable information, including Titan’s migratory route, his resting points and duration of stay. The information will help target conservation efforts on the areas used by turtle doves when they leave the UK. When Titan entered the Mediterranean in 2014, the autumn legal hunts in France and Spain were underway. Estimates suggest that around one million birds are killed across the western European flyway each autumn. Operation Turtle Dove reported Titan’s safe arrival in West Africa in the 2014 winter. He travelled mainly in darkness, covering around 500-700 km per night at speeds of up to 60 km per hour and crossing vast inhospitable landscapes including the Gulf of Cadiz, the Atlas Mountains, and Sahara desert. “This is the first time that we have ever been able to track a UK-breeding turtle dove to its African wintering grounds. Previously we largely relied on ringing the birds, which didn’t give us half the amount of data Titan’s tag has,” said Dr John Mallord, RSPB Senior Conservation Scientist. Titan’s tagged trip to Mali, West Africa took one month, passing through France, Spain, Morocco, Western Sahara, Mauritania and Senegal. This feisty turtle dove spent six months in Mali before making the return trip to the same area in Sussex where he was found. Titan set off for Africa again in September 2015. He is currently wintering once more in Mali and is expected to return this spring. Titan’s previous return trip avoided Malta, so he should be spared the hunter’s bullet. Mallord is hoping that Titan won’t keep them waiting as long as he did last year when he didn’t show up until June. A sandstorm in the Sahara may have forced him to turn back to Mali and delay his departure. His late arrival in the UK probably cost him the opportunity to breed last year, with most birds returning and pairing up in late April. This highlights other impacts on breeding success. Using migratory route data, stopover and wintering areas can be investigated for roosting sites, as well as food and water sources, to determine reasons for the turtle dove’s catastrophic decline in the UK. According to the RSPB, turtle dove numbers in the UK fell by 74% between 1995 and 2009, attributed to reduced breeding success, reduced feeding habitat with changing farming practises, changes in wintering habitat in Africa and also to the recreational spring shooting in Malta. The Operation Turtle Dove project also includes collaborative initiatives with farmers whereby turtle dove habitat is created on farmland by planting nectar flower crops, keeping uncropped cultivated margins for arable plants, and growing tall hedgerows for nesting. Food producers are also involved through the ‘Fair to Nature’ conservation-grade scheme where products meet sustainable farming standards. Catherine Bearder, Liberal Democrat Member of the European parliament for the south-east of England, has been pressuring the EU’s environment commissioner to strengthen and enforce laws protecting turtle doves. Migratory birds such as the turtle dove cross borders and countries must work together to protect them. “These migratory birds belong to the whole of Europe. That is why we need strong EU laws to ensure they are protected at each stage of their journey,” Bearder says in the Guardian. The RSPB points to the extinction of the North American passenger pigeon 100 years ago as a warning of the turtle dove’s fate if hunting and habitat loss are not addressed. A long-standing cultural symbol of love, friendship and devotion, the turtle dove’s extinction would be another ecological tragedy. RSPB Operation Turtle Dove reported in May 2016 they have received no data from satellite-tagged Titan since April 2016 when he was recorded in Mali, Africa. This could be due to transmitter damage, battery failure, or in the worst case, to Titan’s death, but the RSPB are remaining optimistic and hope Titan is spotted in future in his Suffolk breeding grounds. © All posts are protected by copyright with all rights reserved. You are very welcome to link to an article, but if you would like to re-publish my work, commercially or non-commercially, please contact me. Thank you. With her passion for nature, health, education, and sustainability, Tracy writes creative content that connects with readers. She helps tell people's stories, build brands, and grow businesses. Thrives on words, birds and enthusiasm. For hire at www.tracybrightenwriter.com.